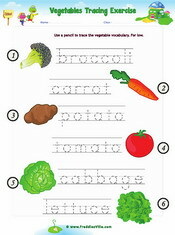 These ESL worksheets will help teach and review words related to vegetables and expressions used when shopping for vegetables. There are matching exercises, writing and more. 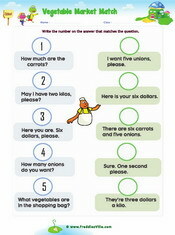 This ESL worksheet is useful for practicing expressions used when shopping for vegetables. Learners are expected to match questions to answers. Learners have to draw lines to match word spelling to picture. 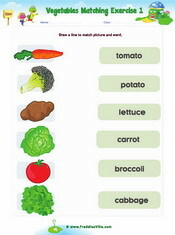 Carrot, broccoli, tomato etc. Learners have to draw lines to match word spelling to picture. 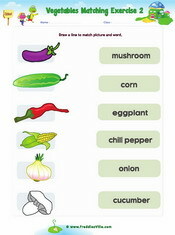 Eggplant, cucumber, mushroom, onion etc.